If anybody wondering who is Maraa, you won’t have to look hard to find her. When you see a girl with a “zzZzzZ” smoking from her head in the middle of the park, you obviously have found her! Nadia = Hi Maraa, where do you live? Maraa = I live in the UK. N = Are you in school or already work? M = Yes, I’m in school. In 10th grade. N = What is your favorite subject at school? M = My favourite subject in school is art, but I also like French. N = What kind of art? M = Any type. But at the moment, at school, I’m doing cubism art with instruments. Cubism was the first abstract art style of modern art. In cubist artworks, objects are broken up, analyzed, and re-assembled in an abstracted form. Any instruments would do, but I mostly use, a guitar, piano, flute and a drum. They are easy to draw. N = What kind of other art have you done? M = I haven’t done any other art yet. But after I’m done with this, I will get to choose my own topic. Though I haven’t decided yet. We are given options to choose from. N = I know that you are in your sophmore year, but have you think of what school you are going for? M = After I finished school, I’m going to 6th form for 2 years. Which I think I will go to the same school. And after that I’ll be going to the University where my sisters’ go to. N = What is your future plan? M = Well my parents want me to become a doctor. So I think I’ll just work hard to become one. N = What kind of doctor? M = Not sure yet. Doctor of medicine, I think. N = Are you into biology and science? M = Only science, I don’t really like it. But since I want to become a doctor, I have to like it lol..
N = Are your parents doctors themselves? M = Nope. My mum always wanted to be one, but for some reason she couldn’t, so she wants me to be one. N = How many siblings do you have? M = I have a twin sister (twinklee), and 2 older sisters. So it’s four of us. Even though Twinklee is my twin sister, we don’t look anything alike, we’re non-identical. N = Does your parents want Twinklee to be a doctor too? M = Nope. She has no interest in Science whereas I had a little. N = If you have interests in science just a bit, would it be hard to get into? M = Yeah it will be hard. That’s why I’m going to work very hard in Science. And one day I’ll be very into it! N = Are you fluent in French? M = Nope. Not fluent. I just started learning a year ago. But it’s quite easy so maybe I might be speaking fluently soon. N = When you’re studying medicine, would you be learning latin also? M = Lol…….. Nope that will be too hard! N = How did you find SocioTown? M = My sister, Twinklee, found it when she was searching for virtual games. N = What do you like to do in SocioTown? LOL.. I think this sleeping “disease” is contagious to Jacky! We’re Going to Space Next Week! Okay, I might have lied about that. We can’t really go to space next week, sorry! 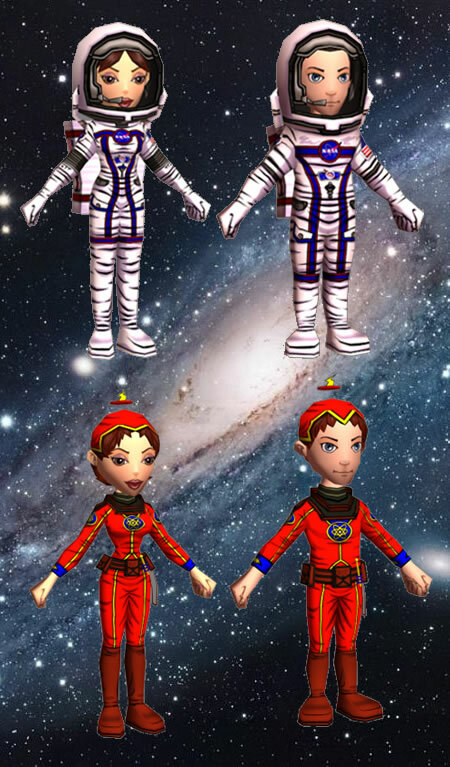 But we can give you the next best thing and that is to give you the gears that a spaceman and a spacewoman would need in order to make that possible - suits! These protective suits will be coming next week to a clothing store near you!